Good Afternoon! A cloudy, but pleasant one (temperature-wise), here in Red Bulls Land. Before tomorrow's massive home fixture, against Chivas USA, let's get to some RBNY happenings from the past week. Despite the Red Bulls losing a midweek friendly up @Montreal, Mr. Backe declared mission accomplished. RBNY's Swedish coaching genious was looking to gain "sharpness, training and evaluation" for several non-starters. With wholesale changes made in the second half, he was able to achieve just that. Players that have not featured much (if at all) in League play, such as Carlos Mendes, Tyler Lassiter, Stephen Keel, Matt Kassel, Corey Hertzog, Sacir Hot, Teddy Schneider & John Rooney, got some good minutes against Le Impact. Also getting some good minutes were goalkeeper Greg Sutton (who played the whole 90) and right back Chris Albright, who saw his first action of the year. Mr. Backe also gave some minutes to three RBNY U18 Academy players (Sean Davis, Brandon Allen & Dan Metzger). Post match comments from this one can be found here and a some photos here. The Mexican Soccer Federation released the names on it's 23 man roster for next month's Concacaf Gold Cup. Of no surprise whatsoever was the news that RBNY's Mexican DP center back, Rafa Marquez, was included on that list. More of surprise was that RBNY's Costa Rican left back Roy Miller was excluded from his country's Gold Cup roster. A bit of luck, as this would give Chris Albright, who will (more than likely) deputize for Miller @left back, more time to gain fitness, should Miller be called up for the Copa America later this Summer. Amid much fanfare, MLS unveiled it's initial Castrol Performance Index. According to the CPI, Thierry Henry is, currently, the #1 player in our league. Just how is all that figured out? Please click here to find out. You can check out the full CPI, where all RBNY starters are among the top 100 players in MLS, by clicking here. Thierry Henry's tally against the Los Angeles Galaxy last weekend was voted MLS Goal of The Week. More of a surprise was that Tim Ream's miraculous goal-line save, from the same game, was voted MLS Save of The Week. It was the SoTW, no doubt, but I never thought a field player was eligible. Thumbs up to MLS for that one. Here's a nice story on RBNY rookie Tyler Lassiter, courtesy of The MLS Reserves. Two member of the RBNY U18 Academy team, Dan Metzger and Bryan Gallego, have just been called up by the US U18 National Team for a tournament in Portugal. The Home Depot Center has been named by MLS as the site of this year's MLS Cup. No surprise there, as Galaxy CEO Tim Leiwecke leaked that little secret to his team's fans this past March. That will make it 5 times, out of 16, that Los Angeles will host the big match. 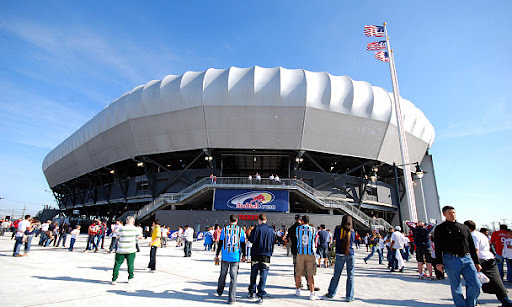 The Cathedral of Football, Red Bull Arena (built by Makita) has just been nominated for the "Sports Facility of The Year" award by Sports Business Daily. The New York Red Bulls and former Croatian superstar Davor Suker are teaming up for a "Mini Clinic for Charity" to benefit the Croatian American Charitable Foundation. Additionally, the Red Bulls and the CACF have teamed up to host Croatian Heritage Night during the June 10th home game against the NE Revolution. Finally: stories of racism in "The Beautiful Game" are, unfortunately, not few and far between. Most of the time, however, the involved parties are in some far away land. This one was shocking to me, as the victim was a 13 yr old youth player from Pennsylvania. The response by RBNY, however, was incredible. That's all for today. Viper Out!